At long last a genuine helper for busy people in busy. This cleaning trolley is a 360° mobile storage unit with four colour coded trays. Each lift off service caddie provides a place for everything in an easily identifiable colour. Each removable caddy has everything on board to do the job in hand, no more running around looking for different bits and pieces; it just couldn't be any simpler. This cleaning cart is ideal for use in all environments and because of the colour coded compartments you can have bedrooms in one colour, bathrooms in another, WC's yet another. 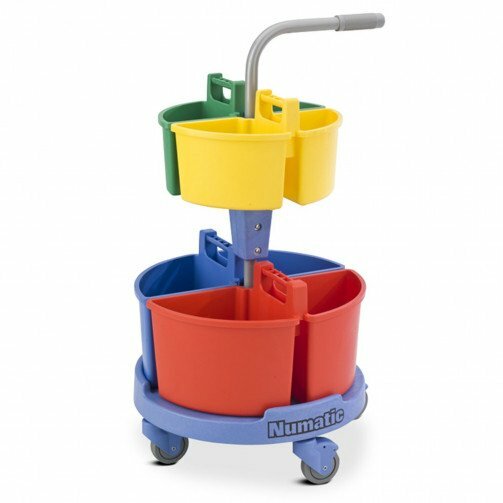 This trolley is comely bought schools and educational organisations because of its size but for that reason it is popular with many other industries that are in need of a mobile cleaning storage unit. Equipped with a unique lift-off system, made to have a non-snag chassis. Because of the trolleys 360° design it allows easy access from all sides and a unique push/pull handle. It has 2 small service caddies (green and yellow), and 2 large service caddies (red and blue). Huge storage capacity and heavy duty non-marking castors.